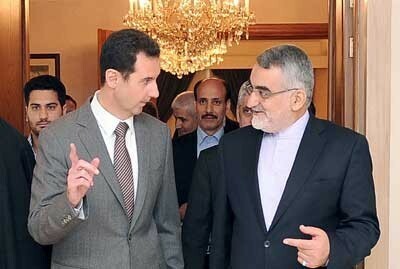 A leading member of Parliament led Iran’s delegation to Syria on Wednesday, meeting President Assad. Alaeddin Boroujerdi, the chairman of Parliament’s National Security Commission, blamed the US for backing “terrorist groups” challenging the regime. He said the terrorism “could backfire against Washington itself”. Iran has provided essential economic and military aid to Assad since the Syrian conflict erupted in March 2011. Last July, Tehran extended a $3.6 billion line of credit, covering oil supplies for Syria’s crippled and sanctions-burdened economy. The Revolutionary Guards have provided advice, logistical support, and intelligence, while Iranian officers are training pro-Assad militia. Tehran has backed the Syrian regime’s emphasis on a 2014 Presidential election, rather than a transitional governing authority in which Assad would step aside. President Rouhani said on Wednesday that forthcoming fuel price increases, spurred by the lowering of State subsidies, will have a “mild slope” steadily increasing throughout the year. The Supreme Leader’s top advisor, Ali Akbar Velayati, supported the hike in prices to raise Government revenue and decrease energy consumption. The Ahmadinejad Government reduced subsidies on fuel in December 2010, but the plan was hindered by bureaucracy and disputes between the President and Parliament. Critics say support payment to cover price rises have exceeded the revenue from the subsidy cuts. Iran’s oil exports have risen for a fourth consecutive month, according to sources who track tanker movements. February’s rise is around 100,000 barrels per day (bpd) to a total of 1.3 million bpd. Tehran’s shipments fell last year to a historic low of less than 800,000 bpd amid US-led sanctions. February’s figure is still 40% below Iran’s exports of 2.2 million bpd in 2012. A tracking source said extra cargoes had headed to Syria, which received a $3.6 billion line of credit from Iran last July, and South Korea. Sales to Iran’s top two buyers, China and India, remained steady. PreviousSyria Daily, Feb 27: Otaiba – An Ambush of 175 Insurgents or 45 Civilians Killed by Regime?